National feast of the Annunciation "is part of the Lebanese mission"
Beirut (Agenzia Fides) - In Lebanon, today's Marian solemnity of the Annunciation of the Lord has been recognized a national holiday since 2010. 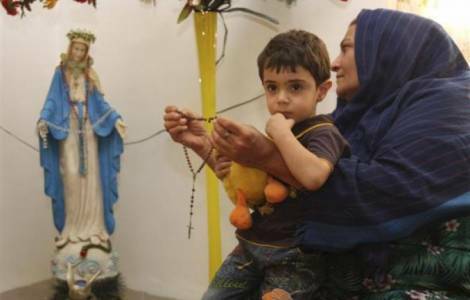 Even today, in various Lebanese churches and sanctuaries, Christians and Muslims will together experience acts of veneration for the Virgin Maria. Sunni Sheikh Mohamad Nokkari, who teaches in the faculty of law in Beirut, Dubai and Strasbourg, wanted to further national reconciliation and inter-communal friendship, by raising the profile of the Virgin Mary, who is a point of reference for both Christians and Muslims. During a trip to Lebanon organized thanks to Opera Romana Pellegrinaggi, Sheikh Noccari told Fides-: «My wife and I, who is French, had a statue of the Virgin Mary at home and there was a relative who every time he came to visit us would insult her, hid her in the bathroom, and once he broke the statue in two. I bought another one, made of heavy metal, so that it could no longer be damaged". That family incident helped give the Sunni professor the idea that Mary was to be celebrated together by Christians and Muslims. "I talked about it in Lyon with Jesuit Father Louis Boisset", remembers Mohamad Nokkari, "and we verified that there were no obstacles of a doctrinal nature for an initiative of this kind. Who, better than the Virgin Mary, can bring Christians and Muslims together?» At the beginning, the idea was to make the Islamic-Christian celebration of Mary coincide with the feast of the Immaculate, but then the idea changed because it was important to bear in mind that Orthodox Christians have not defined the dogma of the Immaculate Conception of Mary. The choice of the date to celebrate Mary by Christians and Muslims fell on the feast of the Annunciation. The Annunciation of the Angel to Mary is narrated both in the Gospel and in the Koran. Mary is the only woman mentioned by name in the Koran 34 times (while Mary's name appears in the Gospels 19 times). The first Islamic-Christian celebration of the Feast of the Annunciation was hosted in the Lebanese sanctuary of Our Lady of Jamhour, in 2007. The political leaders were impressed by the initiative, and in 2010 Prime Minister Saad Hariri, who is also now at the head of the government, proclaimed March 25 a national holiday, the day on which the Annunciation is celebrated. «At that time, Nokkari recalls, I was secretary of the Grand Mufti of Lebanon. When I took the initiative to celebrate together, Christians and Muslims, the mother of Jesus, there were tensions that led to my resignation». The political forces did not show opposition to the shared celebration of Mary. While among religious communities, at first some were wary because they feared that it was an expression of syncretism. «But very soon, the Sunni Shaykh adds, it was evident to everyone that everyone celebrates Mary according to their faith and their Tradition». The only oppositions remained those expressed by Salafist and Wahabite groups. And someone also implemented forms of intimidation, damaging the professor's car. «I thought that sometimes, to follow Mary, we have to suffer, but she» adds Nokkari «is a mother who embraces us all: by following her, and also going through moments of suffering, good things can flourish for everyone». From Lebanon, the custom of Christians and Muslims to celebrate together the feast of the Annunciation is spreading in other countries: Canada, France, Brazil, Spain. Also in Jordan March 25th could soon become a national holiday. While courses are held at the University of Saint Joseph and doctorate theses are dedicated to Mary in Christianity and Islam. Politicians seem to have understood that the common reference to Mary can also favor and preserve national unity. Sunni Prime Minister Saad Hariri has shown sensitivity to various requests, such as the construction of a center for initiatives linked to the Islamic-Christian national holiday of the Annunciation. There is also a proposal to dedicate a square here in Lebanon to the Annunciation, and to propose that the UN proclaim March 25th as a day of Islamic-Christian dialogue.